Travis Grant and Connor Baxter have dominated the 2013 SUP Race Cup, which drew a stacked field of 100 paddlers to St. Maxime, France and marked the official start of the unofficial European SUP Racing Tour presented by NSP. 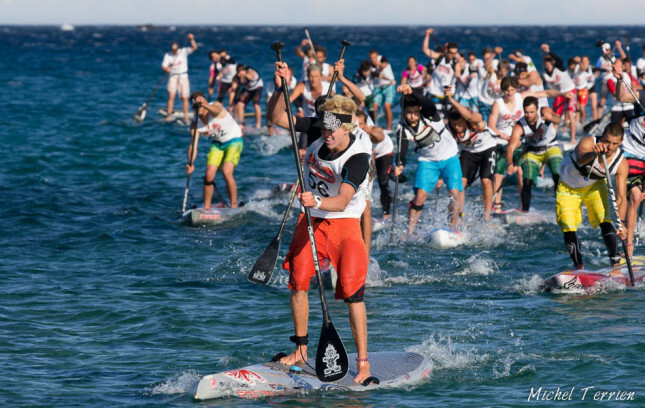 This event was a tale of two days; on Saturday the winds were apocalyptic and the Beach Race turned into a survival paddle, while Sunday was much calmer (and warmer), producing an epic Distance Race. The field was absolutely stacked, as many of the world’s best paddlers in Europe for the next few weeks, but in the end it was the favourites Travis and Connor who filled the top two spots on both days. Meanwhile the women’s event was a three way battle between Angie Jackson of Australia and the local French paddlers Olivia Piana and Celine Guesdon. As in the men’s, results were reversed on Day 2 and the overall result was decided by the narrowest of margins. So for yesterday’s Beach Race, which was supposed to be a 7km, Battle of the Paddle-inspired, in-and-out course, the organisers had to do a quick reshuffle. The start time was delayed until the evening, in the hopes the wind would drop off. First until 17:00, then 18:30. The wind did gradually drop, but only very slightly. When we hit the water it was still absolutely macking, and even with the change in course – four laps straight up and down the coast, trying to stay out of the wind – conditions were still pretty gnarly. It was headwind one way, cross-wind the other. Not easy. The course was officially reduced to 5km (though one paddler’s GPS said only 4.3km…) which gave us some relief from the wind, but also turned it into an all out-sprint for 30 minutes. Partly due to the extreme conditions and partly due to things getting lost in translation, the start was mild chaos. Everyone was getting a little bit impatient after having waited around for hours; we just wanted to get on the water and get this race done. Roughly 100 paddlers were lined up at the start. We were bunched up together in knee deep water and as soon as the horn went, we sprinted out to the first buoy that was only 100 metres off the beach. If you’ve ever seen the BoP, you’ll know how crowded the first buoy turn can be. And that’s with only 70 guys and a good 300m to thin out the field. So with 100 paddlers having only 100m to separate themselves, you can imagine how crammed the first buoy turn was. It turned into a gnarly traffic jam that caught out everyone who wasn’t fast enough to sprint clear off the beach. To their credit, almost all of the favourites managed to avoid the carnage and get around first, so it didn’t have a huge impact on the final standings. After that it was a headwind paddle up the beach, then a loop back to the start. We did that four times and pretty soon it was like a snake chasing its tail as the favourites eventually caught the back-markers. From my vantage point way back in the pack I had a great view of the lead bunch as they rounded the buoys at each end of the course and paddled back towards us. Connor Baxter pretty much led from start to finish. How, I don’t know, but he never let anyone past despite some incredibly fast paddlers sitting behind him. Young South African charger Dylan Frick was second at one point, but made some mistakes on the second lap and drifted back. Paul Jackson was sitting in second or third for the first lap, looking very strong until he had a head-on collision with a back-marker that strayed onto the wrong side of the course; the giant chunk out of the front of his board forced Jacko to retire. Travis Grant had a good start as well and stuck with Connor the entire race. Casper and Jake Jensen were up there as well. Eric Terrien was sitting around 4th but fell at the start of the second lap, losing contact with the lead pack and dashing his hopes of defending his title. Arthur Arutkin was punching above his weight and keeping contact with the leads for much of the race. Beau O’Brian slipped back to the second pack but charged his way through on the final two laps to eventually finish 5th. However by the third lap, the real race was happening among the first four guys; Connor, Travis, Casper and Jake. Connor was in front every time I looked up. Travis made a couple of moves, trying to paddle wide and get past him on the downwind/crosswind portion of the course, but could never break the champ. The two of them constantly made slight gaps on Jake and Casper, but the two kids on the yellow boards always caught back up. On the final stretch, Trav and Connor got a few seconds clear and sprinted to the line, but despite a late surge from the Aussie, Connor held on for a much deserved win by just two seconds. Jake passed Casper in the final sprint to claim third, with Beau in 5th and Eric Terrien the leading local in 6th. In the women’s race it was a good battle between the Fanatic team mates; Angie Jackson of Australia and France’s Olivia Piana, though Celine Guesdon was right there the whole way as well. Angie proved too strong in the end, winning by a minute, with Olivia hanging onto second ahead of an impressive Celine. So that was the Beach Race. We woke up this morning to much calmer and warmer conditions. The apocalyptic mistral winds had backed off and although the there was still a bit of a breeze, it was definitely manageable. The 17km Distance Race hit the water at 10:30 and again there were 100 paddlers on the start line. 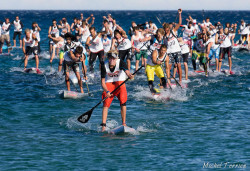 In the Battle of the Paddle, which this event is modelled on, the Distance Race plays second fiddle to the Elite Race. However here in France it seemed to be the other way around. This felt like the main event. After the chaotic start in yesterday’s Beach Race, the first turning buoy had been moved a lot further from the beach, which largely avoided the traffic jam. A good start was still important though, as there was obviously going to be a lot of drafting and if you missed a spot in the lead pack within the first couple of minutes, you were never getting back. At the 1km mark a bunch of 18 guys had broken clear from the field. All the big names were in there; Travis Grant (who had to make up three seconds on Connor Baxter to claim the overall event title) was leading the train, with Connor, Jake, Casper, Eric and Gaetene Sene right on his tail. The early race pace wasn’t super fast; with such a big draft train none of the favourites were interested in doing all the work, though eventually the Italian Stallion Fabrizio Gasbarro took over at the front on his 14 footer (most of the elite guys were padlding 12’6 boards) and the pace began to pick up. 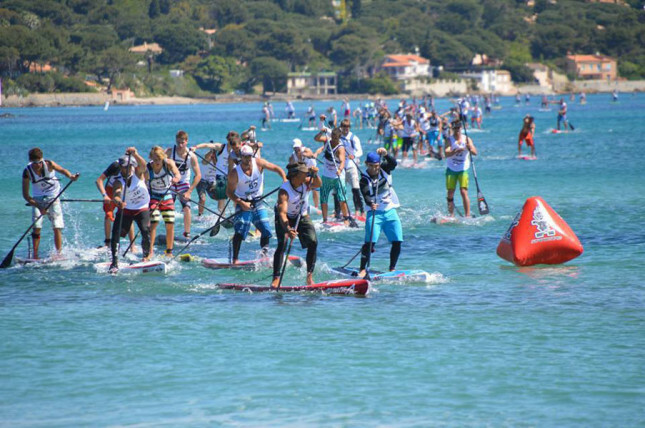 The lead group held together for the first 5km, where the water was relatively flat and calm, but as soon as they rounded the St. Maxime headland, the stiff headwind started playing havoc with the race order. The bumpier water made it much harder to draft, which allowed the elite guys to splinter off and take control of the race. As the wind became more of a factor, the draft trains started to break-up right throughout the field. The first five or six had a gap on the rest of the field and there were very few groups with more than three or four competitors. A slight downwind leg gave the ocean specialists another chance to break free, with Connor and Travis setting the pace ahead of guys like Paul Jackson, Beau O’Brian, Chase Kosterlitz and Casper Steinfath. By the time they rounded the final buoy and with a straight 1km paddle to the line, Travis Grant and Connor Baxter were 30 seconds clear of the chasing groups. At that point Connor was still in control; all he had to do was stick with the Aussie and he’d claim the overall SUP Race Cup trophy. But Travis dug deep and found a tiny bump to gain a few metres. This slight gap was all he needed, with Connor unable to keep up and Travis sprinting clear to win the Distance Race and overall event titles. Beau and Paul sprinted home together, almost catching Connor and making it three Aussies in the top four. Chase Kosterlitz beat home the young guns to round out the top 5, with Casper and Jake following. In the women’s event, Angie Jackson held a one minute lead from the Beach Race but was not in peak health and couldn’t hold onto Olivia and Celine, with the latter claiming line honours. The overall result was incredibly tight, with just six seconds separating Celine and Angie after almost three hours of paddling across both days. Olivia had to settle for third while up and coming star Manca Notar took a solid 4th place. The action today was the complete opposite of yesterday, which ended the event on a high note. 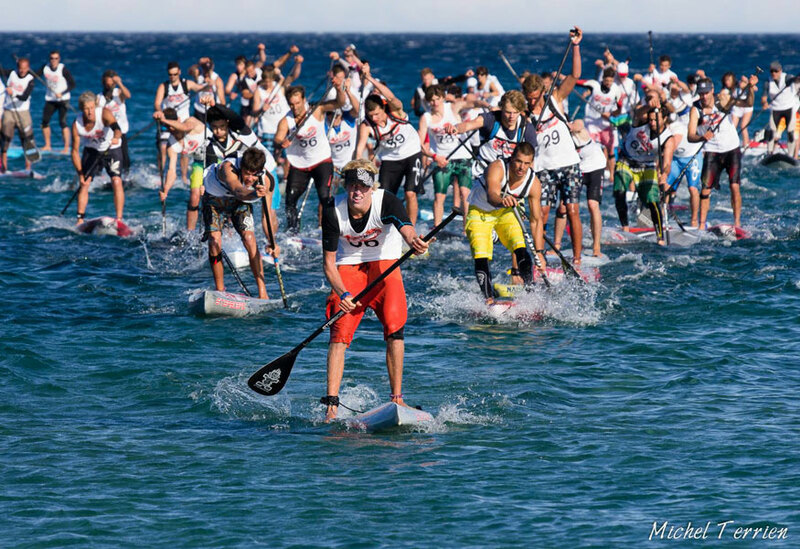 Despite the grinding conditions and chaotic start of the Beach Race, the 2013 SUP Race Cup was an awesome event and kicked off the European SUP Racing Tour in a memorable way. 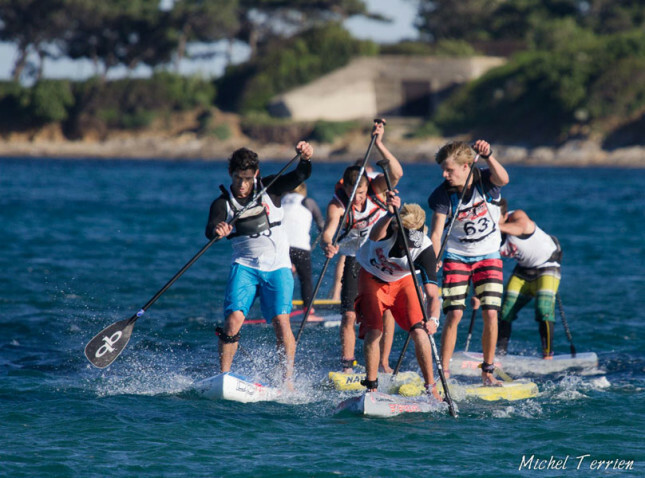 Next week we’re off to Germany for the big Lost Mills race, before heading back to France for the Oleron event. In the meantime check out the full SUP Race Cup results below, then come back tomorrow for photos and video of the action.